We set out from Highland Road Park at the usual 8am launch time, with Bayou Fountain up a few feet due to the rain earlier in the week. We decided to take advantage of the water level to temporarily skip the last major blockage, paddling right around it and on downstream. How far did we get? The photo above was taken from right up against the bank… of Bayou Manchac! We’d been watching the weather quite closely of late. 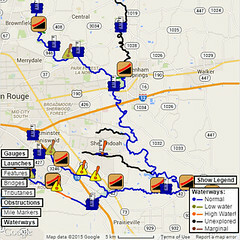 After last week’s 1.66″ of rain on Tuesday (the 4th) had the water up perhaps as much as a couple feet for Expedition Ten, the 2.35″ of rain (2.13″ on Tuesday) this week was certain to leave the bayou higher than normal. Sure enough, when we arrived, we found it something like three feet above “normal” levels. That put waders right out (as none of us are nine feet tall), so we headed downstream planning to work from the canoes. On the way downstream, we found that Blockage #11 had been considerably shifted about by the hard-flowing water. We performed some quick maintenance on it, but it’ll take a bit more work to tweak it later. The water impinging on it and flowing right-to-left across it, coupled with logs from upstream, had bashed just a couple logs free — logjam herding is an imprecise discipline, it seems, at least until the initial settling. Blockage #15 was wide open without issue, although the giant whale of a tree at the downstream end appeared to have been shifted by the water. We’re curious to see how much it may have moved, but that’ll have to wait for lower water. Three feet or so of extra water wasn’t that significant at Highland Road Park, but by the time you got down past the wall and beyond #15, the much lower banks quite quickly became completely inundated. Only by making soundings with our paddles could we know where exactly the bayou’s channel ended and the flooded banks began. As we neared Blockage #19, the last of the major logjams, we had a bit of discussion. With the bayou up, it would be rather more difficult than usual to get to the causes of the jam, and it would not be easy at all to get everything stable and interlocking so it doesn’t wash out or end up cluttering the banks (which were rather effectively hidden, dare we say). As it was just two of us out there, and the two most adventurous of us, we called an audible. As we arrived at Blockage #19, we simply skirted right around it and kept going downstream to see what we would find. As we kept paddling downstream, we found more and more small, easily cleared blockages, many with just one or two long (or looooong) logs. With the water high enough to float them, stubby broken limbs and all, we merely had to break them free of the mud, branches, and vines to send them on their way. The inconvenience of high water turned out to be a great convenience. After a considerable amount of effort, we finally made it through the “brushy” section of the bayou (with lots of branches tangling things — logs, paddles, our hats). Almost as if by magic, we suddenly found ourselves in the free and clear last leg (about 3/4 of a mile, more or less). As we caught sight of the first bankside structure (a wooden “dock” on the north bank), we recognized from earlier paddling trips that we were home free to Bayou Manchac — there was much rejoicing. We paddled out of the mouth of Bayou Fountain and across Bayou Manchac to Ascension Parish (in the tradition that by touching the far bank, you can make indisputable claim of having completed the trek), and some photos were taken. 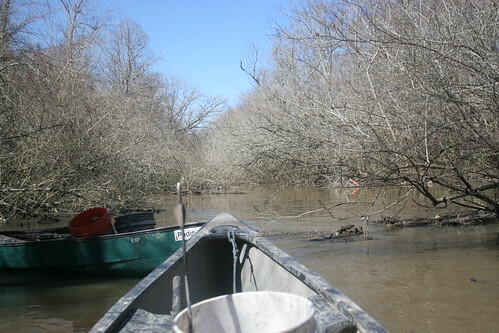 Of course, then it was time to start heading back upstream, as we had four miles of bayou to cover. We continued working the small stuff as we progressed. Logs we’d slid over on the way downstream were lassoed and pulled free of their mud and their vines. Several branches were inadvertently tasted. (For the record, they taste like bark.) The current was no problem, and the paddle was pleasant on such a nice day. After making it back through the brushy section, it was on to #19 again, this time from downstream. The water had not dropped significantly from the start of the day’s paddle, so it was not a problem to paddle around #19 and continue upstream. The turkey vultures that had been there in the morning were there again, and they do make quite an interesting bit of noise as they fly off. (Here’s hoping they’re eating any dead things that may be in the jam.) This would be the last time we’d leave Blockage #19 intact — next weekend, we’re going to start hitting it, come low or high water. 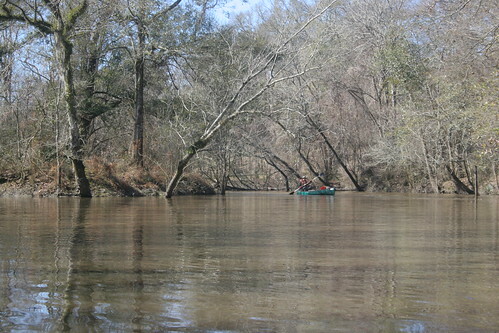 One would be hard-pressed to find a more perfect spring day to be paddling on the bayou. The air was warm. The sky was non-threatening (and occasionally bright, but not so much or so long as to get hot). The water was 50°F. 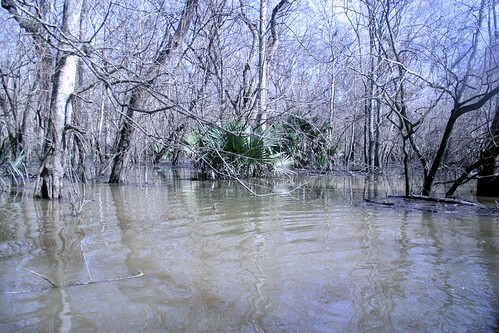 (Okay, that part was a bit chilly, but you don’t *swim* in the bayou.) I suppose it shouldn’t be a surprise, then, that at we continued toward Highland Road Park we saw a great sight: six people in canoes out on the bayou! Yes, there *are* people other than us who enjoy a nice day on Bayou Fountain. We exchanged greetings and gave them a quick progress update, and then we headed back to the park. We have a bit of remedial work to do on the first couple miles, but nothing major, and we have Blockage #19 to clear. That will likely throw a few bits downstream that muddle the waters there, too. 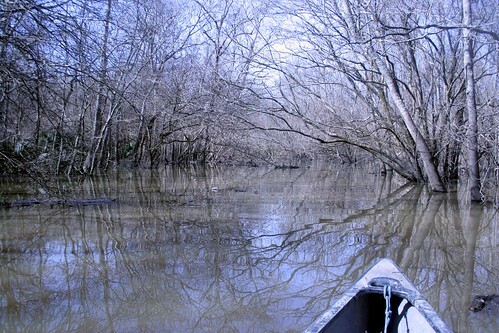 Still, we just paddled from Highland Road Park to Bayou Manchac and back in canoes without needing even once to get out. One more major jam and some finishing work is nothing compared to what we’ve worked through so far, and we’ve already made it through with just a little help from high water. While we’ll certainly have ongoing maintenance to deal with, getting Bayou Fountain to paddle-capable is now firmly a matter not of “when” but of “if”.